Don’t freak out about felting! Over the years of being a designer I’ve noticed that people tend to avoid certain kinds of crochet projects even though they like the look of them: projects with zippers, projects with faces, and especially projects that felt crochet. What is it about a felted project that makes people run the other way? We all know how long it takes to crochet something. To have it ruined in the felting process would be crushing. You might feel like you have no control once you put your project in the washing machine, like you are leaving the outcome of your project completely up to chance. 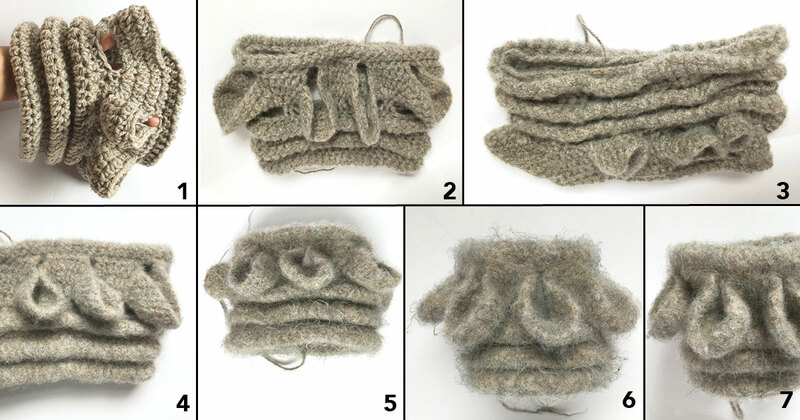 So I’d like to walk you through the process so that you can feel confident about felting. Felting happens when the wool fibers are agitated or rubbed against each other. Although felting can happen when the wool is dry, it happens much more readily when it is wet and in hot water. Little scales along the fiber will become entangled and matted together. Sometimes a bit of laundry soap helps lift the scales along the fibers as well, but it isn’t always necessary. 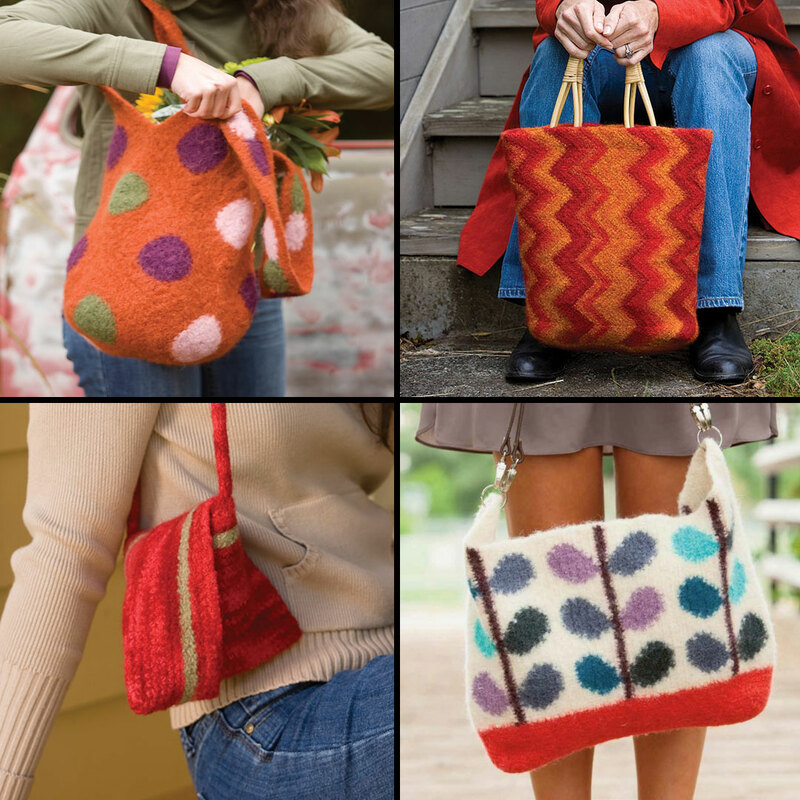 Bags are terrific projects to felt crochet. Clockwise from top left: Bubble Bag by Tracy St. John (photo by Joe Coca); Felted Chevron Tote by Leslie Ann Bestor (photo by Kathryn Martin), available in the free ebook How to Felt Crochet; Winterbloom Bag by Amy Gunderson (photo by Harper Point Photography), and Fortune Cookie Bag by Josephine Woo (photo by Joe Coca). 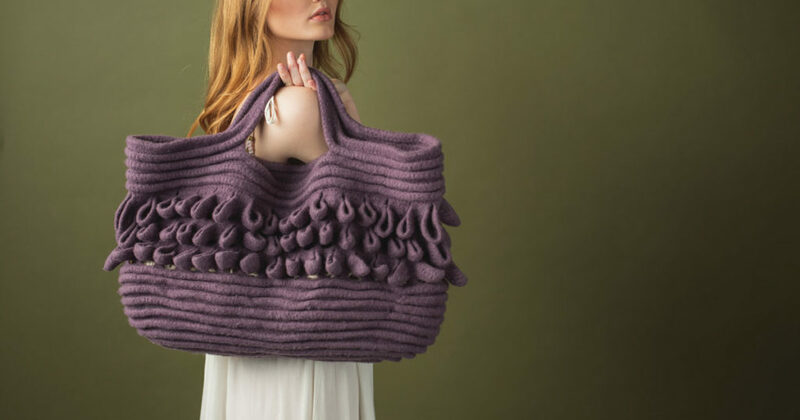 Choose a felt crochet project that doesn’t need to match an exact size (such as the Sea Scale Tote from Interweave Crochet Spring 2019). Use yarn that is entirely animal fiber (affiliate link) (such as sheep’s wool or alpaca); it can’t be a superwash wool (which is treated so it will not felt in the wash). Watch out for white wool yarns; chemicals that are used to make it a true white color may cause it to resist felting. Create and felt a swatch test first. This is the swatch before felting. You can see the spaces between stitches because it was crocheted on a larger hook (looser gauge). A loose gauge actually helps your project felt faster and more evenly. This is eight minutes into the wash cycle. At this point the stitches grew larger! This is pretty common as wool relaxes when it gets wet, but it will start to shrink as it felts. The stitches are still noticeable, but they are starting to get fuzzy. This is another eight minutes into the wash cycle (sixteen minutes total). You can see that the fabric is very soft and fluid. The fabric will start to stiffen as the felting process progresses. This is the end of the first wash cycle. You can see that the stitch definition is starting to disappear and the fabric is becoming thicker and stiffer. Although the felting appears a bit uneven, it will even out with time. This is the middle of the second wash cycle. You can see that the fabric is getting sturdier, the stitches are nearly indistinguishable, and the texture is very fuzzy. This is the end of the second wash cycle. You can see how much stiffer the swatch is now. Throw the swatch in the dryer, but take it out when it is still a little damp. The drying helps eliminate some of the fuzziness and further shrinks the project down. Be sure to block the project, allowing it to dry completely. Once it’s dry, you can trim the excess fuzz if you would like. Grab your crochet project and throw it in the washing machine. If it’s small enough, you can enclose the project in a zippered pillowcase. Also toss in some old jeans so the project has something to rub against. Set your machine for the hottest cycle and the smallest load (you might need to do two wash cycles). Monitor the project as it washes and continues to felt down. Optional: You might want to use the dryer to finish the felting process. I hope this will quell any fears you have about felting. It is a fun and magical process that gives you a fantastically sturdy and smooth fabric that would be otherwise impossible to achieve. Brenda K. B. Anderson crochets and knits on her end of the couch after her kids have gone to bed. She is the author of Beastly Crochet and Crochet Ever After and just can’t seem to resist starting new yarn-y projects. You can find her on Ravelry as yarnville.